I get distracted easily. Really easily, in fact. So it’ll come as no surprise that I spent a good ten minutes stalking NPCs in Frogware’s The Sinking City, a detective game set in a flooded town named Oakmont where half-human creatures live alongside humans as they live their ordinary lives. Because in The Sinking City, the NPCs do so much in the background that I actually feel like I’m walking through a living, breathing world. I don’t even mean NPCs featured in quests - these are anonymous bystanders and nameless extras found in bars, streets, and shops, going about Oakmont as if it’s perfectly normal to pass half-eaten sharks and twisted coral clinging to the sides of buildings. 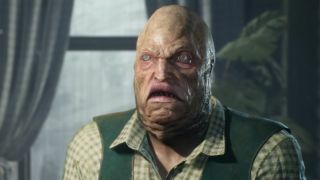 During my time with The Sinking City I saw NPCs (*deep breath*) vomiting, brawling, fishing, begging, lying down in the streets (either that or they’re very dead), scavenging, fighting while they’re scavenging, beating each other up, kicking broken-down cars, despondently sitting in broken-down cars, warming their hands around flaming oil barrels, roasting fish above flaming oil barrels, carrying delicate little parcels, selling fish, preaching, praying while walking, waiting for a shoe shine customer, trying to get clients to come back to their boudoir, and crying. That last one is fair enough, as Oakmont is literally a damned place. It’s not just what they do that makes the city feel like it’s thriving in a twisted kind of way. Creepy is the norm in Oakmont, and it really shows in how these NPCs are dressed: striding down streets are Innsmouthers with their half-fish faces or cultists with skin masks, strange staffs, and suspiciously red body paint. And yet no one gives them a second glance. Worshipping the Lovecraftian elder gods is integral to Oakmont’s identity, so they mingle with ordinary-looking civilians instead of lurking underground like you might ordinarily expect, and it doesn’t take long for it to become obvious that you’re the weird one for thinking they’re strange or even threatening. At first, hearing people call you an Outsider is an insult, but seeing these NPCs go about their business really makes you feel like you just don’t belong. All of these unique little habits that the NPCs have sell you on the idea that, even though the city has been flooded by some supernatural force and the deep-sea divers are all going mad, they have their own little lives to be getting along with. Some of those lives are hard, they force people to scavenge from broken crates strewn throughout the streets, while others can walk home on the posher side of town carrying a tidily-wrapped parcel without a care in the world. Seeing both kinds of people will give you serious Skyrim and Red Dead Redemption 2 vibes, as each game had their own little world going on in the background: farmers toil in the fields, people beg on the side of country roads, and each day people can be found hawking their wares in the market. Unfortunately, there’s not quite the same level of sophisticated NPC interaction in The Sinking City as there is in Red Dead Redemption 2, as they won’t cower if you aim a gun at them, or even let you stop and chat a while. Mind you, part of you could be generous and interpret their reticence to talk as being a consequence of their frankly dismal mood because they’re living in a half-flooded city where people are so terrified that they trade in bullets instead of money. Calling that place home would make me pretty messed-up too. Apart from those that will give you quests, NPCs in The Sinking City aren’t the main focus of the game by any means. Yet having them busying around in the background as you try to find your way around Oakmont makes the game feel alive, and most definitely semi-cursed. Their mixture of erratic and reasonable behaviour proves just how deep the Lovecraftian corruption has wormed into Oakmont, and when The Sinking City comes out on June 27, you’ll get the chance to try and figure out how to make those strange NPCs’ lives a little better.